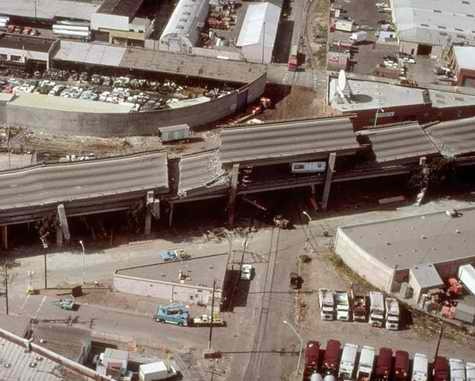 I remember I was talking on the phone with my best friend after school when the earthquake hit us in 1989. My friend asked if I felt the earthquake and I said "yes" but we brushed it off because the initial shake was very subtle. Then the ground shook hard and I felt my house swayed left and right. I dropped the phone and called my brothers to take cover. My experience was pretty ordinary but my friend's was hilarious. She said she was four at the time. Her mom was sewing clothes and when the earthquake came, her mom quickly grabbed her baby sister who was only a couple of months old and took cover under a table. My friend said her mom just left her sitting on the sofa. She remembers being frightened and calling out for her mom but her told her it was going to be ok and to just sit there. My friend says, "Yeah, my mom grabbed my sister and left me sitting on the sofa". hey I still remember that earthquake. If my memory serves me right, I was watching the news with my grandmother when a car was shown crashing down on the SF bridge from behind a news anchor who is doing a live broadcast. Pretty scary stuff. It's a good thing most of the earthquakes we have now are happening under the sea. GOvernments should probably start giving surfing lessons to everyone. @Ryhen - The car that crashed down on the Bay Bridge is probably one of the most memorable scenes in everyone's mind. I will write a follow up post about that eerie incident. Ocean earthquakes, in my opinion, is more deadlier than land earthquakes because of possible tsunamis that could occur. I don't think anyone can ever forget about the 2004 East Asia tsunami. I never encounter an earthquake before. Wow your friend's encounter was bad... I guess the mother panic and was lost. @ladyviral - Malaysia has no earthquakes? I never knew that! You are very lucky then. Earthquakes are scary because they happen so suddenly. Poor kid! I've never experienced an earthquake either. I cannot imagine how it must have felt to your little friend to be left sitting on the sofa! I am guessing her mom just panicked. @Cascia - I guess you too don't live in earthquake zones. Lucky for you then! @Cheryl - I said the same thing too, that maybe her mom just panicked. My friend was laughing so hard about the incident. I'm glad she didn't take it in a negative way. I remember that earthquake vividly. I was at home and my house shook very hard. My mom called to pick her up from work and while driving around the city, I saw a lot of destructions and chaos. There were fires, collasped homes, and of course later on I heard about the freeways and the Bay Bridge. It was definitely scary. We are due or overdue for another big one. @KN- being a Sfranciscan, I think many of us remember the damage to the city after the earthquake. In my neighborhood, there was no damage. I didn't venture out to other parts of the city cos I was still young then and didn't drive. 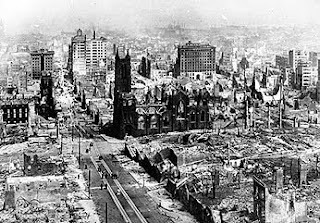 I remember the news broadcasting parts of the city that was on fire and houses and buildings collasped. Malaysia do have earthquakes.. at least recently since Tsunami occured... but where I stayed, I do not feel them... mostly those in high rise buildings will. I remember that Quake well. My wife and I along with our young son lived in Cupertino California. (About 50 miles closer to the Loma Prietta Fault from San Francisco). We had gotten a babysitter so that we could go to the world series that evening. It was eerie calm that evening there was no wind at all and the bay looked like glass (Earthquake Weather for sure). We got on our motorcycle and drove to Candlestick. We were on the upper deck at candlestick park when the quake hit and you are right initially it was a small thump then nothing. Next candlestick park started to sway violently. you could see the expansion joints in the cement touching then coming apart. After the quake we at the park were cut off from the rest of the world. we could not figure out why the game didn't continue. we sat there for an hour or so until some people that had a transistor radio started telling everyone how bad it was and to go home. on our motorcycle it took us 3 hours to go the 50 miles home. we were driving on sidewalks and between the traffic. I will never forget coming up over the hill and seeing Silicon Valley as far as you could see with no lights and no power. we had no power at home for 4 days and had to break out the camping stove to cook for the neighbors. Our son eas alright. and the bright thing about having no power and nothing else to do is that My wife became pregnant again and we had a baby girl (Rachael) exactly 9 months to the day after the earth quake. She is our earth Quake baby. I hear that there was a lot of them =).